In an attempt to keep their heads above water, cruise lines are moving ships away from low-profit regions such as the Caribbean and Alaska and sending them to Europe, Southeast Asia and Australasia. For families eager to take advantage of cruising’s outstanding value next summer, author Douglas Ward advises them to look no further than the Mediterranean and Northern Europe, where there is an increased supply of cruise ships – which Ward forecasts will lead to greater discounts being available in 2013. The 284 hard-hitting reviews in this eagerly awaited Guide expose the best and worst scoring cruise ships using an internationally accepted rating system devised by the author, the most respected (and feared) critic in the business. The only source of independent star-ratings for virtually all ocean-going cruise ships worldwide, the Guide takes into account a remarkable 400 separate items based on personal cruises, visits and revisits to ships, as well as observations and comments from Ward’s team. The new Berlitz Guide identifies the top-rating ships for 2013, none of which are classified as Large or Mid-Size. Sitting firmly at the top of the 10 most highly rated vessels, all of which are either ‘Small’ or ‘Boutique’, is Europa, a ‘Small Ship’ owned by Hapag Lloyd Cruises. This vessel, which Ward describes as offering “the best cruise experience available today unless you own a private motor yacht” comes out on top for the 13th year and is once again the only vessel to be placed in the exclusive 5-star Plus ‘club’. 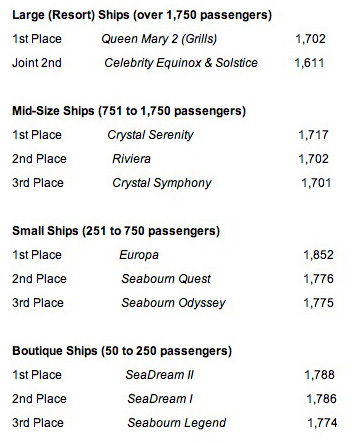 Seabourn’s ships scoop a remarkable 3 out of the Top Ten Small Ships and 3 out of the Top 10 Boutique Ships, while SeaDream gets the top 2 slots in the Boutique Ships category and Celebrity Cruises is credited with 7 of the Top Ten Large Resort Ships.